“Dooley’s Galaxy: Where the Afterlife Is Out of This World” is the theme of this year's Dooley’s Week, the beloved Emory student tradition honoring the university's unofficial mascot. “Dooley’s Galaxy: Where the Afterlife Is Out of This World” is the theme this year of Dooley’s Week, an Emory student tradition honoring the university's unofficial mascot and once Lord, now Lady of Misrule. 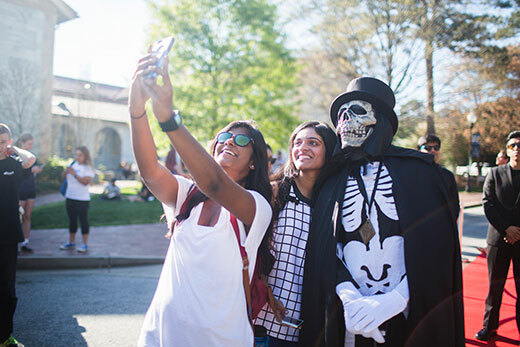 Claire E. Dooley — by tradition, the silent skeleton takes on the first name and middle initial of Emory's current president — and her entourage will appear throughout the week to join in the fun, starting Monday, April 3. Dooley's Week continues with a variety of activities, including games, food trucks, music and a performance by comedian Nikki Glaser. All events feature free giveaways and prizes. Students must present ID for all events; registered guests must present their wristbands. Students are also encouraged to write a limerick on Dooley's Facebook timeline in hopes that Dooley might be inspired to stop by and dismiss the writer's class, another quirky tradition of the week. The Student Programming Council organizes Dooley’s Week. This year's events are produced in collaboration with a variety of student organizations including TableTalk, College Council, The Pulse, the Latin Student Organization and the Office of Sorority and Fraternity Life. The week begins with Blast Off Day at Asbury Circle from 3 p.m. to 5 p.m. A carnival ride, ice cream and cupcakes and giveaways are planned. On Tuesday, McDonough Field will be the scene for Taste of Emory, with different food trucks from local Atlanta restaurants providing free food for Emory students. Among the trucks expected are Mediterranean Grill and Sublime Doughnuts. Taste of Emory begins at 5 p.m.
After sampling Taste of Emory, students are invited to make their way to Asbury Circle for the second annual Couchella, the Emory Arts and Music Festival. The festival, to be held from 6 p.m. to 8:30 p.m., features an exhibition of artists’ work and music performances all by students. Couchella co-sponsors are The Pulse of Emory, whose mission is to inspire and nurture passion for the arts by producing a diverse array of productions and events, and TableTalk, a framework for conversation between people who would not interact under ordinary circumstances. Wonderful Wednesday — held weekly in Asbury Circle from 12-2 p.m. — will feature a Dooley’s Week theme with Dooley Galaxy stickers and space-themed food and activities. Later on Wednesday, the Latin Students Organization will host Salsa Under the Stars, also in Asbury Circle, from 6:30 p.m. to 8:30 p.m.
Thursday features two big events with the College Council Slide 'n Scoops and the Intergalactic Laser Tag Party. Slide 'n Scoops will be from 12 p.m. to 2 p.m. in Asbury Circle. Students can enjoy ice cream from Butter & Cream in Decatur while playing on an inflatable slide. Later on, from 6 to 8 p.m. at McDonough Field, play laser tag, get some more free food, make a lava lamp and come early for a glow in the dark flying disk. “Bring a group of friends to play laser tag together or come solo and meet some other great Emory students while you play,” says Penelope Pentzas, Dooley's Week co-chair. Comedian Nikki Glaser comes to campus on Friday, April 7, for a performance in Glenn Memorial Auditorium. The time is to be determined, Pentzas says, based on the rescheduled Dooley’s Week concert. Glaser is also a writer, producer and talk show host. She has appeared in the Judd Apatow-directed film “Trainwreck” and in specials for Netflix and Comedy Central. The Dooley’s Week concert will be held either Friday, April 7, or Saturday, April 8, Pentzas says. The Student Programming Council is working to schedule a performer for the concert in the wake of a fraudulent situation with an artist booking agency. According to an official statement from the university, Emory "negotiated with and paid an entity which fraudulently claimed to represent a major entertainment act to appear on Emory’s campus. The university has filed a police report in this matter." "Emory’s Division of Campus Life is convening a working group of students and staff to review processes related to contracts and financial transactions and implement recommendations to prevent any future fraudulent activity," the statement notes. Check the Dooley’s Week 2017 Facebook page and follow emoryspc on Snapchat and Instagram for more updates on all things Dooley’s Week.